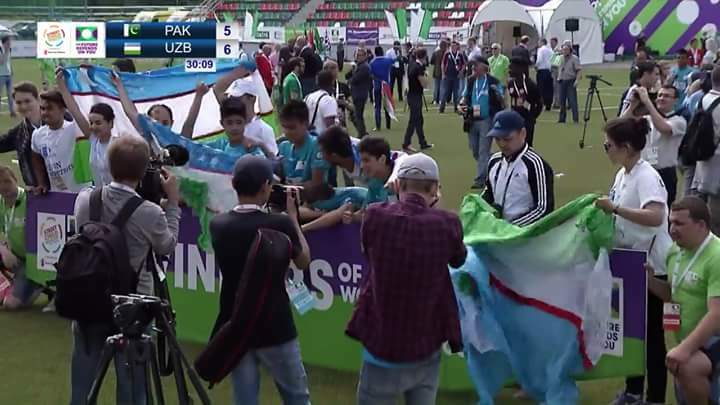 Pakistan put up a tough fight but lost to beat Uzbekistan in the final of the Street Child Football World Cup. The match was tied 1-1 at the end of full time and headed to a penalty shootout. In the shootout, Uzbekistan pulled ahead 6-5. Pakistan had beaten Indonesia in the semi-final on Monday. The boys in green outclassed Indonesia 5-4 on penalties to secure their place in the final, where they will face Uzbekistan for the trophy. The match had remained goal-less draw when the final whistle blew. However, in penalty shoot-outs, both the teams managed to score four goals each. In additional penalties, Indonesia missed the target after conceding a goal to Pakistan. On the other hand, Uzbekistan had beaten Burundi in their semi-final encounter 1-0. Pakistan captain Mohammad Abdullah was named Player of the Tournament for Boys competition. Abdur Rasheed, the head coach of Muslim Hands Pakistan Street Child team, had told Geo.tv that the team would give its best to bring the gift of the trophy home. Earlier in the tournament, Pakistan had played a goal-less equaliser against Uzbekistan in the first match, then defeated Russia 3-1 and Tajikistan 2-0 on way to the semi-final.